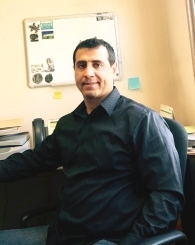 Anwar Boumosleh is an associate professor of finance. He holds a PhD in Finance from the University of Alabama, An MBA from LAU and a AKSOBA in Finance from AUB. He has been teaching MBA corporate finance and Investments since joining LAU in 2005. Boumosleh also taught at the University of Central Florida. His research interest is in corporate finance; specifically, corporate governance and CEO and director compensation. He is also a CFA and has worked in the Lebanese banking industry as a financial analyst and advisor, as well as an internal auditor. He has been a member of several councils and committees at the School. Boumosleh, A. & Cline, B. (2015). Outside Director Stock Options and Dividend Policy. Journal of Financial Services Research, 47, 381-410. Boumosleh, A. (2012). Firm Investment Decisions, Dividend Policy, And Director Stock Options. Journal of Applied Business Research, 28(4), 753-768. Boumosleh, A., Dah, A. & Dah, M. (2012). Internal Capital Markets and Equity Restructuring. Journal of Applied Business Research, 28(6), 1171-1182. Boumosleh, A. (2011). Product Market Competition and CEO Entrenchment.The Business Review, 19(1), 172-178. Boumosleh, A. & Raad, E. (2011). Market Reaction to Capital Expenditures of Powerful CEOs. International Journal of Financial Services Management, 5(4), 356-368. Boumosleh, A., Cline, B. and Saleh, R. (2009). Product Market Competition and CEO Negotiation Power. Journal of the Academy of Business and Economics, 4, 143-154. Boumosleh, A. (2009). Director Compensation and the Reliability of Accounting Information. The Financial Review, 44, 525-539. Boumosleh, A. (2007). Internal Capital Markets and CEO Power. Journal of the Academy of Business and Economics,7, 47-53.